Non-messy. Or should it be 'un-messy'? Whatever it is, it's awesome. 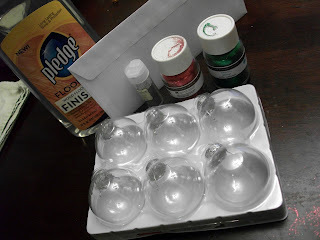 This idea is from another website, Cricut Holiday. Go visit it. It's terrific. Some glass ornaments (find these at Michael's or Hobby Lobby... they are almost always on sale but you can use a 40% off coupon at regular price to make these pretty cheap). Pledge Floor Finish with Future. I'm not sure what the 'future' is, but that's what it's called. 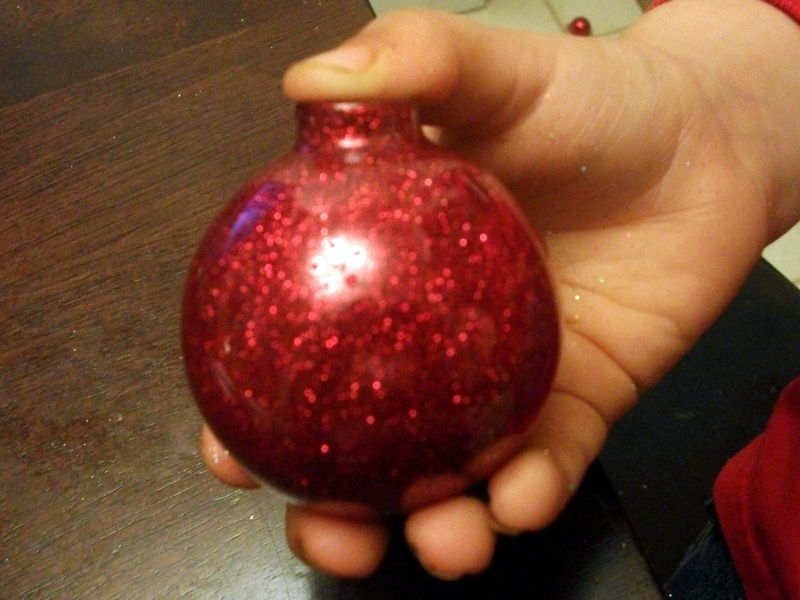 Pop the top off an ornament and squirt some of the floor finish into it. 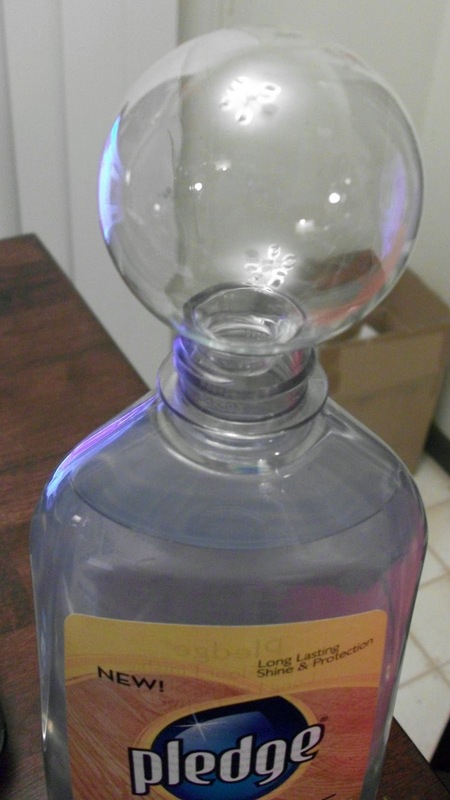 Don't squirt it too hard though, because it will froth and make bubbles inside. Just let it pour. You'll only need a little. Swirl it around, careful not to shake it. 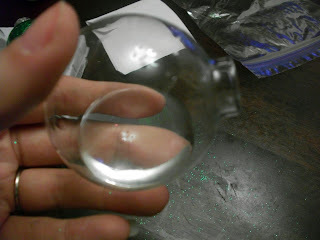 I used a plastic bag to hold at the top so I could get the floor finish on the top of the ornament too. Put the ornament over the bottle to let the excess drain out. 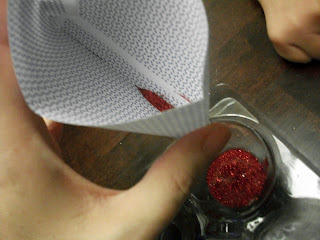 Snip the corner off an envelope and use it like a funnel to pour some glitter in. My 6-year old son helped to shake the glitter around. Just hold your thumb over the opening and shake it like a polaroid. Awesome song. Pop the tops back on. I thought I might give these as a gift, but they might be a little to cute... I'm thinking I'll throw some ribbon through the loop and put them up on our tree. This will require some serious thought. And there's no mess on the tree! Love these! These are so cute! 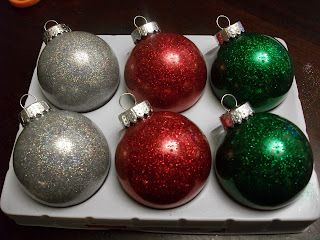 Just last night I was adding glitter to some old ornaments to spice them up because, as I'm sure you know, glitter makes everything better :) Mine was on the outside because they weren't clear but I love this idea!! I love this idea. No glitter falling off all over the floor and tree. These came out great. I've seen them done with white glue, this looks easier and nicer for some reason, (maybe just because you did it ;P ). Now I am all caught up, I never skim your posts. I just have to skim when I'm behind, but not YOU, your to stinkin' fun!!! These look so pretty. Very well done. I just made a glitter candle with alternating stripes of green and red. I know what I'm going to do next, and this will be much less messy, woo hoo!